Enter your zip code to find a plan for you and your family. Please enter your valid zip code. No plans available in this zip code. Find a participating Careington provider in your area. If you have questions about your discount plan or need to find a provider in your area, Careington's Member Services Department can help. Contact us to learn more about selling Careington plans in order to serve your clients and customers better. Contact our Sales Department to learn more about the benefits of our discount plans and how to improve your access to care. If you are a group interested in purchasing one of our plans or leasing one of Careington's dental PPO networks, our Sales Department can assist you. Whether you are a dentist interested in joining our network or a current dental provider with questions about Careington's plans, one of our representatives will be more than happy to help. *Plus a one-time, non-refundable processing fee of $20.00. This plan is not available in VT & WA. GC: CIDVT14. 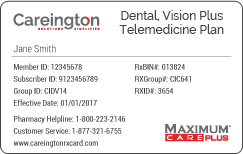 Sign up for the Careington Dental, Vision Plus Telemedicine Plan. THIS PLAN IS NOT INSURANCE and is not intended to replace health insurance. This plan does not meet the minimum creditable coverage requirements under M.G.L. c.111M and 956 CMR 5.00. This plan is not a Qualified Health Plan under the Affordable Care Act. This is not a Medicare prescription drug plan. The range of discounts will vary depending on the type of provider and service. The plan does not pay providers directly. Plan members must pay for all services but will receive a discount from participating providers. The list of participating providers is at www.careington.com. A written list of participating providers is available upon request. You may cancel within the first 30 days after effective date or receipt of membership materials (whichever is later) and receive a full refund, less a nominal processing fee (nominal fee for MD residents is $5, AR and TN residents will be refunded processing fee). Discount Plan Organization and administrator: Careington International Corporation, 7400 Gaylord Parkway, Frisco, TX 75034; phone 800-441-0380.